Small - £161.99 Only 5 left! Medium - £161.99 Only 6 left! Large - £161.99 Only 6 left! There is a knack to granting wishes. Trust us we know. We’ve been wishing that our bosses would bring back Taco Tuesday, but after the Food Fight of 2009 they refuse. We have asked every magician, palm reader, and witch in town. All say the same thing, we have to learn from our mistakes before they can help us. Pfft, as if we would start another fight over whether burritos or tacos are the superior food. But you, you have the power to grant wishes. You’ve been doing it forever. Giving your nieces and nephews the perfect Christmas presents. Helping your sister pick out the most awesome pair of red heels you have ever seen. You grant wishes all the time and haven’t even noticed it. All you need is to look the part now. 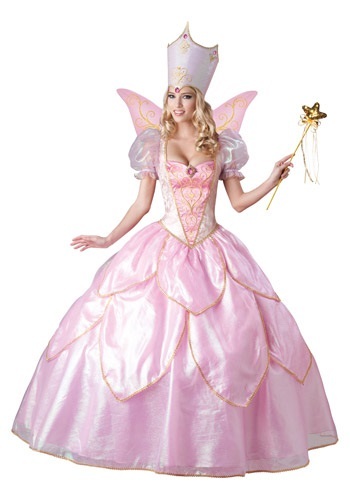 You just have to grant your own wish for this Fairy Godmother Costume. You can do that by hitting the “Add to Cart” button. People will start recognizing you for the selfless soul that you are. Giving everything you can to help other people. Speaking of helping other people, after you fully transform into the kind Fairy Godmother that you are, could you grant our wish of getting Taco Tuesday back? You will have the sparkly gold wand to do it and everything!